The Tonle Sap Experience provides trip reports on the floating villages in Siem Reap. We hope it gives you an unbiased look at life in the villages and allows you to make an informed decision when choosing where to visit. Below we have a Kompong Khleang Dry Season trip report. Kompong Khleang is the largest floating village in Siem Reap. It currently has 4.5 Stars on Tripadvisor making it the highest ranked floating village in Siem Reap. I had been to Kompong Khleang in the rainy season when water levels were high, but I had never been on a Kompong Khleang dry season tour. I was looking forward to seeing how it differed. On March 5, 2018 a group of us made the journey out to Kompong Khleang. We left at 1:00pm from Siem Reap city and traveled in an air-conditioned Toyota Camry which cost $35 USD for the day. While it is a good idea to support tuk-tuk drivers, it might be better to spend a few more dollars and go by car as it is extremely hot in March. After about 35 minutes we arrived in Damdek, the biggest city outside of Siem Reap. We bought water and soft drinks from a local gas station convenience store. Everyone was friendly and seemed surprised to see foreigners doing their countryside shopping. After saying goodbye we traveled a bit more and then took a right off Road 6. This is a smaller road across from a market which takes you to Kompong Khleang. After turning onto the road it took about 20 minutes of driving before we arrived at a checkpoint. This is the Kampong Khleang Ecotourism Center. This is where everyone has to buy tickets if they wish to visit the floating village and take a boat to the lake. The checkpoint has bathrooms as well if you need to use the restroom and one seller had drinks and snacks. Interestingly, in the rainy season, this is where you leave for the floating village tour. There is a boat dock you walk down to and enter the tourism boat. That is because the water is very high and it is easy to launch from there. As March features the Kompong Khleang dry season tours, the dock here is completely dry. So, instead, you leave the checkpoint in the van and drive another 15 minutes or so to the center of Kompong Khleang. After the 15 minute commute we arrived at the dry season port. This is where people bring there fish from the lake. We parked here in front of the temporary boat dock, located under the Wat Kompong Khleang. We didn’t visit the pagoda (as we had been there before) but you can visit if you wish. Instead, the three of us walked over to the dock, showed our tickets and loaded onto one of the community tourism boat. The driver turned the boat around and we started making our way through the village. While I knew I was going on a Kompong Khleang dry season tour of the floating villages I didn’t fully expect what that meant. It was very impressive. The houses are very high in the air (around 3 stories in some cases) and there is no water touching them…they are on the land. The homes are supported by long wood beams. There is a spectrum of homes as well – from very small brush homes to large wood homes with nice roofs and garden plants. 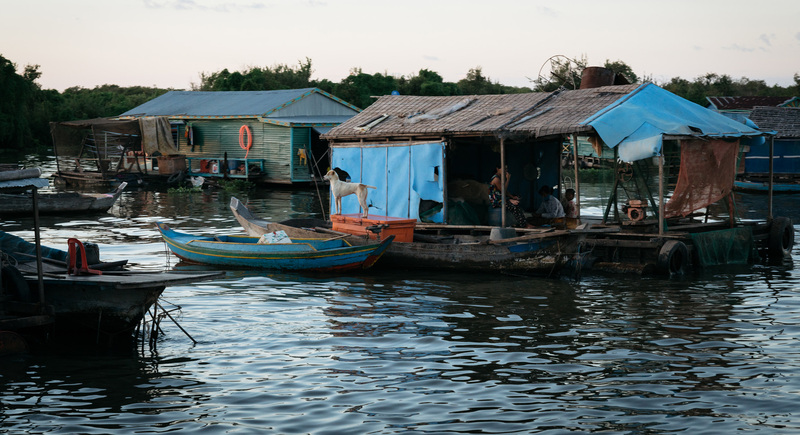 What you see in the dry season is just how high up they are to survive Tonle Sap flooding. Some of the support beams as well as so thin it’s hard to believe! The total journey through Kompong Khleang lasted about 15 minutes. We then arrived in what is a waterway that connects Kompong Khleang to the Tonle Sap Lake. The boat slowed down as there was a lot of traffic. Locals were going back and forth from their homes in Kompong Khleang and there is not a lot of space. The boat ride did feel longer than last time. Another difference from the rainy season is what you see while passing through the canal. In the dry season this is covered by water but, as the Tonle Sap can change by up to 30 feet in depth, this is now dry land. As a result, there were a lot of farmers who had planted vegetables and were working the fields. All had built makeshift homes on the lake. They are basically bamboo siding with a leaf roof and are similar (although simpler) than some of the homes in Kompong Khleang itself. They would also use really interesting bamboo contraptions to water the fields. After about 25 minutes of navigating the canals we arrived at the beginning of the Tonle Sap Lake. Out on the lake were hundreds of homes as well as a floating primary school which was closed and police station. Some of them were docked near the land a bit further out. We decided to pull over and were able to get off the boat and walk on dry land next the homes. We decided to stay on this piece of land as there was a game of volleyball going on. Sunset was astounding and we took away some great photos of floating homes on the lake. Being able to play volleyball while watching the sunset with local was a big benefit of a Kompong Khleang dry season tour. We took our time with sunset and made our way back to Kompong Khleang with the tourism boat. There was no traffic on the way back as fisherman had already came in for the day so we got back in about 20 minutes. From there our driver was waiting and we drove back to Siem Reap City. Visiting Kompong Khleang in the dry season was a contrasting but interesting experience. It is fascinating to think (and see) how much the Tonle Sap water levels change in the village. It looks like a completely different place this time of year and something you don’t expect. The boat ride was slower but still excellent with the benefit of seeing farmers. Sunset was great and I enjoyed seeing the floating homes at the end of the trip. Would definitely recommend visiting if you have the time in March. We are always looking to share more experiences. If you would like to share your floating village trip please send us an email.